Does one have to live in France to be a Bon Vivant? Or be present in Italy to experience La Dolce Vita? And why do we strongly associate certain delicious experiences with a particular place... Most importantly, how do we translate "living the good life" for ourselves and set out to create a lifestyle we want right where we live! To me, being a Bon Vivant has a lot to do with enjoying what your local region has to offer. And I feel nothing inspires this appreciation more than eating and drinking of the land. Just like the mysterious concept of terroir suggests that the taste of wine embodies climate, terrain, soil and even traditions of a place, similarly why not we as people enjoy where we live by truly embracing all the elements. So the other week I went on a Bon Vivant excursion to experience the bounty of my adopted land, The Netherlands! Why not go wine tasting and see how the 'terroir' here affects the wine. We decided to go to Saalhof Vineyard in Wognum. Vineyard!? In the cold and wet Netherlands? My surprise was big as yours, but apparently yes, there are more then 170 commercial vineyards according to Winehoek. The Saalhof Vineyard or, Wijngaard in Dutch, is in the region of West Friesland which is in the North West of The Netherlands. Historically fiercely independent and a bit stubborn people live there. I mean, how many floodings would you put up with before deciding that maybe you should not live in an area that's not meant to be above water? Well, none of that for West Frisians. They keep plugging away, sucking the land dry... for centuries! This resilient spirit is probably what's responsible for the success of Siem and Ada Loos, the creators of Saalhof Vineyard. To grow wine in such a cold wet climate is tricky to say the least. The vines must be planted further apart to give grapes a chance at catching those illusive rays of sun for a few minutes a day. The foliage must be trimmed often so that grapes are well ventilated and stay dry otherwise they can rott. Thus the position of grapes on the stalk is important... the list goes on. And even after all that, not just any ol' grape will grow in this climate. It takes a special kind of grape! For example the Souvignier Gris, a grape variety invented in Germany in 1983, and the Rondo, created in 1964, a grape very resistant to winter frost and mildew. So what in the world possessed Siem and Ada to start a vineyard? Apparently one too many bottles of wine... literally. They were sitting around with neighbours, drinking wine and talking about France and the art of enjoying life. About the romantic atmosphere of the French vineyards, of reaping the fruits of your land and then gathering with family at the end of the day to enjoy a big meal all together. For Siem it wasn't just wine fueled talk, it sparked a realization of the kind of lifestyle he wanted, and inspired a mission to create it right here in his own country. My family immediately felt the joyful vibe as we pulled into the vineyard with its neat rows of vines, large tables set up outdoors for communal eating, and an inviting guest house. It was a gorgeous fall day with sun shining and with a glass of sparkling wine it did feel like we were somewhere in the French countryside. We came with my husband's cousin's family and their two kids for the open day and spontaneously decided to linger on for dinner. 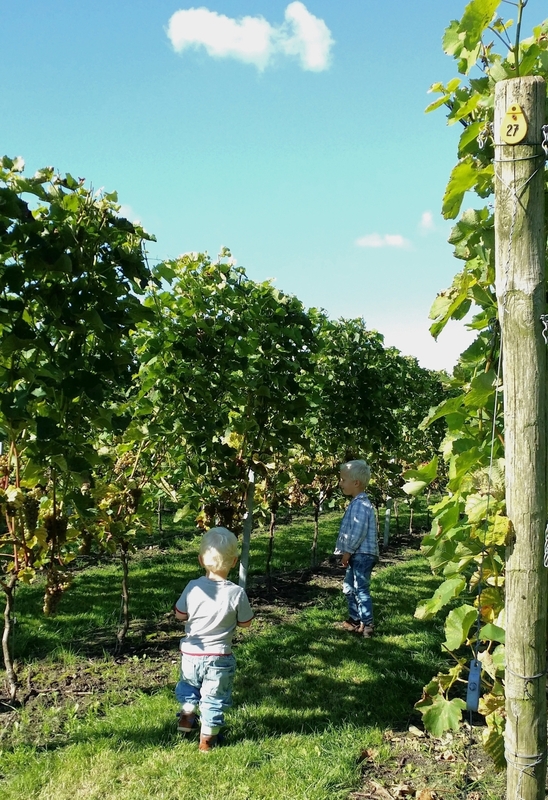 It was such a pleasure to walk through the vineyards, of course the kids ran around, exploring and playing hide and seek between the vines. 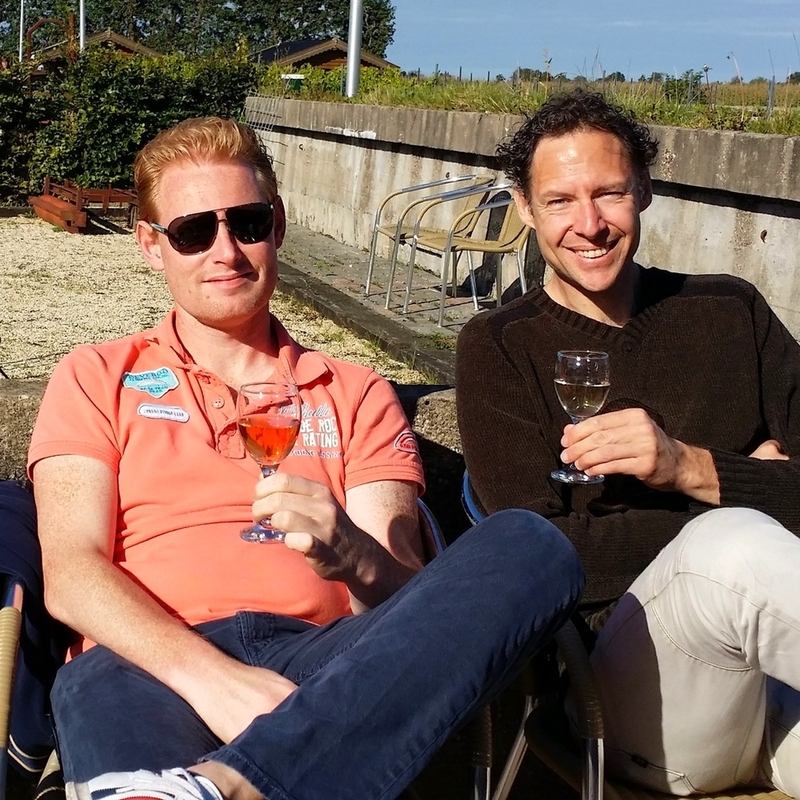 I tried Secco "Het mirakol uit Westfriesland" (The miracle of West Friesland), a sparkling white wine. Made with Johanniter white grape, created in 1968 specifically to grow well in cold and moist regions. After falling in love at first sight with the place, I was worried the wine may not match the expectations. But those worries proved unfounded. From the first sip Secco is an absolue delight. True to the name, the wine is pleasantly dry, and fresh with a delicate aroma of green apples and melon. Light sparkle brought out further the citrus undertones of lemon and grapefruit. Yum! We stayed to eat the most delicious burgers and home fries at the restaurant, Saalig. The sun was setting and we poured another glass of Rondo, a red wine made with Rondo and Pinot Noir grapes, to help "wash down" the satisfying dinner. It was a perfect afternoon! Also the family and staff are really welcoming and happy to chat with you about their work. Of course the best part is the feeling of joie de vivre that washes over you from spending a leisurely afternoon with your family without rushing and just giving each other attention. I grabbed a few bottles of wine to bring home and made a note to come back for one of theme dinners at Saalig. Oh and you bet I signed up to be on the list of volunteers to harvest the grapes!